Laws requiring child-resistant packaging for liquid nicotine containers may have led to a decrease in liquid nicotine exposure in young children. Although pediatric exposure to liquid nicotine has been on the decline since January 2015, which is partially attributed both to legislation that requires child-resistant packaging and to greater awareness of the risks associated with electronic cigarettes (e-cigarettes), liquid nicotine continues to pose a serious poisoning risk in young children, according to the results of a recent analysis of information from the National Poison Data System (NPDS) published in Pediatrics. The investigators sought to examine exposures to liquid nicotine (including e-cigarette devices and liquids) in US children <6 years of age and to assess the effect of recent legislation that requires child-resistant packaging on all liquid nicotine containers. Data from the NPDS from January 2012 through April 2017 were evaluated. During the study period, a total of 8269 liquid nicotine exposures in children <6 years of age were reported to US poison control centers. A large majority (92.5%) were exposed to liquid nicotine through ingestion; 83.9% of the children were <3 years of age. Of the pediatric patients who were exposed to liquid nicotine, 35.1% were treated and subsequently released from a healthcare facility, and 1.4% were admitted to the hospital. The annual exposure rate to liquid nicotine per 100,000 children increased by 1398.2% — from 0.7 in 2012 to 10.4 in 2015. The rate then declined by 19.8% from 2015 to 8.8 per 100,000 children in 2016. In states with no pre-existing law that required child-resistant packaging for liquid nicotine containers, a significant decrease was observed in the mean number of exposures in the 9 months before vs the 9 months after the federal child-resistant packaging law went into effect, with 4.4 fewer exposures per state (95% CI, –7.1 to –1.7; P =.002) following enforcement of the law. 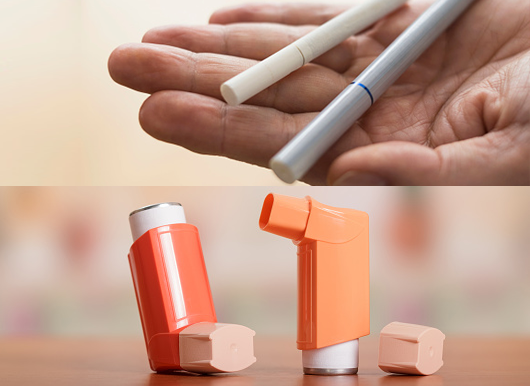 The investigators concluded that the use of additional measures, including child-resistant e-cigarette devices; regulations on e-cigarette liquid flavoring, labeling, and concentrations; and use of flow restrictors on liquid nicotine containers could help to further decrease the incidence of these exposures and the risk for the associated serious medical consequences. Govindarajan P, Spiller HA, Casavant MJ, Chounthirath T, Smith GA. E-cigarette and liquid nicotine exposures among young children [published online April 23, 2018]. Pediatrics. doi:10.1542/peds.2017-3361.